Northwest Africa 7034 is a Martian meteorite believed to be the second oldest yet discovered. It is estimated to be two billion years old and contains the most water of any Martian meteorite found on earth. Although it is from Mars it does not fit into any of the three SNC meteorite categories, and forms a new Martian meteorite group named "Martian (basaltic breccia)". Nicknamed "Black Beauty", it was purchased in Morocco and a slice of it was donated to the University of New Mexico by its American owner. 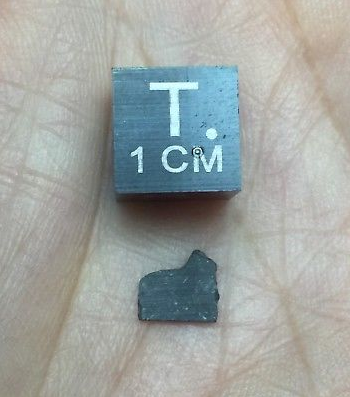 This is a 0.078g part slice from a 3.5g Martian meteorite specimen found in the NWA 7034 strewnfield in the Sahara Desert of Morocco. In November 2016, I took a group of guys to the area to look for meteorites and we spent most of our time looking for meteorites from ‪the Martian‬ fall that has been nick-named "Black Beauty." Two of us on the team found small pieces which are not for sale. However, we met a lucky meteorite hunting nomad who found a 3.5g stone and a couple of us made a deal and purchased it. It is from this specimen that this slice comes from. The name was coined because of the distinct black appearance of the rocks. Laboratory testing proved that the meteorite specimens had not only been blasted off the surface of Mars but they were a totally different type of rock originating from the crust of our neighboring planet. Black Beauty specimens have a distinctly unique regolith appearance when sliced. No other Mars meteorite resembles this unique interior texture. Almost ALL of this material is locked up in institutions. Very little has made it to the collecting world. Here is your chance to get a very thin slice of this most extraordinary specimen. Absolutely guaranteed to be Martian origin. 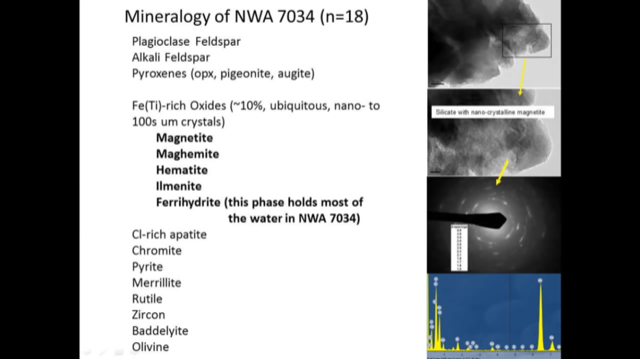 NWA 7034 is a volcanic breccia that has a porphyritic appearance, consisting of plagioclase (andesine) and pyroxene (pigeonite and augite) phenocrysts that are up to 5 mm in diameter set in a fine grained groundmass. Accessory minerals include chlorapatite, chromite, goethite, ilmenite, magnetite, maghemite, alkali feldspar and pyrite. There are even some clasts present that are made of quenched magma. The groundmass is made from fine grained plagioclase, pyroxene, different oxide minerals, and traces of iron sulfides. 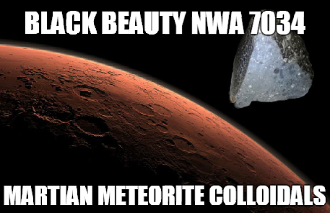 The whole rock chemistry revealed that NWA 7034 has the highest water content ever measured in a Martian meteorite. The water might be derived from oceans that used to exist on Mars, but were still present when the volcanic rock, that would eventually become the meteorite, was erupted. With an age of 2.089 ± 0.081 Ga (billion years) it was formed just at the beginning of the Amazonian period of Mars. It is the second oldest Martian meteorite known. NWA 7034 is the first Martian meteorite that is a breccia and does not fall in any of the known Martian meteorite groups (shergottite, nakhlite, chassignite and ALH 84001). NWA 7034 was classified as an ungrouped planetary achondrite until the Meteoritical Society approved the new designation "Martian (basaltic breccia)" in January 2013. The iron/manganese ratio is consistent with that of other Martian meteorites, but the oxygen isotopes do not correlate with a Martian origin. The change in oxygen isotope ratios could be explained by removal or addition of heavier or lighter isotopes, or by mixing with a mass with a different isotopic ratio. This could happen during aqueous alteration of the Martian crust. Another explanation would be an isotopic contamination of the Martian crust during impact brecciation. Meteorites are filled with information from another time and space. When taking this I, the alchemist, report of a heightened feeling in the pineal gland and synchronization of the hemispheres of the brain. Lots of downloads so great for meditation. An out of this world experience to say the least.